Feelings are delivered perfectly when you send this Striking 15 Mixed Color Gerberas Bunch and spread your love in the lives of the people dearest to you. This 15 Mixed Gerberas Bunch comes arranged with Lush of Green. Impress your dear ones by sending this Captivating Bouquet of 15 Mixed Color Gerberas and elegantly brighten up their mood instantly. 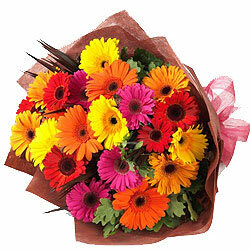 The beauty of this vibrant Bouquet of 15 Mixed Gerberas is enhanced with Green Fillers. Impress your dear ones by sending this Colour-Coordinated Arrangement of 20 Mixed Gerberas and elegantly brighten up their mood instantly.